20 Years a Highly Skilled Machine Shop Engineer. 8 Years the owner of four Newsagents & Bookshops. 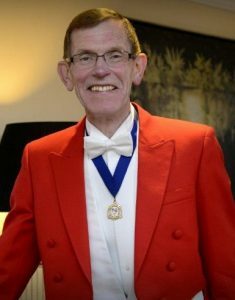 13 Years a Mayoral Officer at two of Greater Manchester’s Local Authorities, I then became a Member of “The Guild of Mace-Bearers” and the Warden of the Northern Region, this were I learned my trade as a Civic Toastmaster. Toastmaster & MC at weddings for all cultures. Master of Ceremonies at Professional Organisation’s Conferences and Toastmaster at their Annual Dinners. Lunches, Birthday Parties, Private Country House Events, Formal Opening and Stone Laying Occasions.